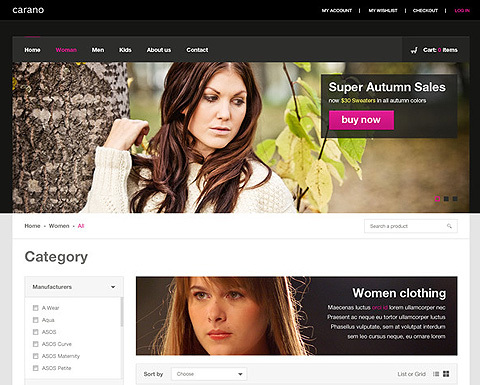 The Carano theme is layer navigation ready so that to provide the best of experience to your clients while shopping. Additionally, the template possesses a customizable menu with images; what’s interesting about this menu is that it displays all of its categories at once, which is extremely useful to customers as they could see everything at a glance. There are configurable links on it as well like the categories, the CMS pages, the external and internal links all of which could be presented with your favourite or most influential images. What’s more the theme has a brilliant footer zone, which is socially ready and could be modulated so that various features could be added to it. To add, the template has two columns of fixed width, which make the content of your site look well-organized and easy to search through. Furthermore the listing style of all the products on offer is in a list or grid form entirely according to your preferences. Last but not least, you can supplement additional modules like the Nivo slider with SEO optimization, the JBX menu, Facebook box with Stylesheet and Last Tweets– all of which will make your online zone extremely handy for users and clients. Finally, as the Carano theme is compatible with all major browsers ranging from IE 8, IE 9 and Safari to Chrome and Opera, you do not have to change the appearance of your page in order to be well-displayed in the different browsers and on different device screens. The Carano theme is simple the best option when it comes to creating your own online store.